Forget using spuds in your mash – try this alternative and add a generous dollop of half fat soured cream instead of butter and milk. Check out our recipe for sausages with creamy celeriac and parsnip mash below. Heat oven to Gas Mark 6, 200C. Put the celeriac and parsnips into a pan of salted water, cover and bring to the boil, then simmer for 20 mins until tender. Line a roasting tin with a non-stick Teflon sheet or baking parchment. Add sausages and roast for 15 mins until golden, turning as needed. Take 2 pans, add 1tbsp olive oil to each, add 1 sliced onion to one and cook very gently to soften. Add the other onion with the red cabbage to another pan with 150ml (1/4pt) water and 1tbsp vinegar, cover and cook both gently for 15 mins. Put the beef stock pot into another pan with the remaining vinegar and 200ml hot water, simmer to reduce to a syrupy gravy for 10 mins, taking care it doesn’t reduce too much! Put the broccoli into a bowl with 2tbsp water and microwave on high for 4 mins until just tender. Drain the celeriac and parsnips, return to the pan with seasoning and soured cream. Mash until smooth. 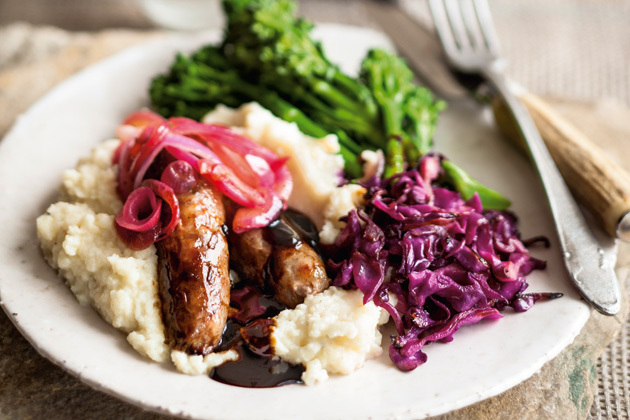 Serve the sausages on the mash, topped with onions, drizzled with gravy, with the broccoli and red cabbage on the side.